We’ve established in previous articles that whilst I like the design and unique features of many Apple products my opinion of replacing all the PC’s in my life with Apple Macs isn’t a thought that I relish.That having been said, it would seem almost rude not to take a look at the Apple MacBook air which was released just a couple of months ago. I have provided a picture with this article as to say that this laptop is thin simply wouldn’t do the machine justice; in actual fact the unit is 0.76” (1.93cm) at its thickest point and an amazing 0.19” (0.4cm) at its thinnest.Quite simply it looks absolutely gorgeous, and I can clearly see the target market being wealthy Londoners who want something vogue to show off in their local Starbucks. Rather unsurprisingly, the small size comes with a couple of drawbacks; mainly price and functionality.The former comes in the way of a £1,199 asking price and the latter hits you with a number of potentially deal breaking omissions in regards to the feature set. 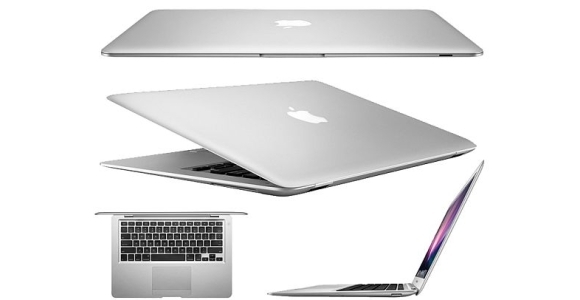 As an example, the MacBook Air lacks of any form of removable media device, such as a CD/DVD-ROM drive – If you want to load or save any files to or from any external source then you have a choice of using a wireless network, a USB flash drive or an external SuperDrive (CD/DVD Rewriter).It also has a number of usually standard ports and features missing from it and these include a security slot, Ethernet and modem port along with a lack of space for card expansion such as Cardbus or ExpressCard.Unfortunately you also only get a single USB slot which means you will need an external hub if you want to connect more than one USB device simultaneously. These absences are clearly intentional in order to save space and reduce weight and as such I don’t think we can consider them to be ‘design flaws’.This having been said if you would require access to such features then it might be worth considering whether the Macbook Air is right for you. I won’t dwell on the negatives as there is an equally large amount of praise that can be given in what Apple have managed to achieve in this unit asides from just the small form factor. The machine encompasses a relatively powerful and reduced size Intel Core 2 Duo processor which is available in both 1.6 and 1.8Ghz speeds and is shipped with a very healthy 2Gb of RAM.The graphics card is a capable Intel GMA X3100 processor which shares 144Mb of the main system RAM, and the wireless network card supports the draft of a new high speed ‘Wireless n’ standard. The hard drive is a rather small, but potentially adequate 80Gb and comes with the option of a 64Gb SSD (Solid State Drive) which can be used to increase performance.Additional and unexpected features like a huge touchpad that supports mouse gestures, an integrated camera, backlit keyboard and a relatively large, glossy 13.3 inch display will suddenly makes this machine look all that much more desirable. A product like the MacBook air isn’t one that you can really praise or criticise too heavily as it will completely polarise opinions of the end user based on their specific needs.If you’re looking for a product to keep around the home that is going to offer you value for money, staggering performance and bucket loads ofupgrade potential then you couldn’t do much worse in your choice of laptop than this.On the other hand, if the time you don’t spend on the road or in the air is spent in fashionable and trendy wine bars and happen to have a four figure sum burning a hole in your back pocket then the MacBook Air is the certainly product you’ve been waiting for.